Half of the practices drivers will get before the 102nd running of the Indianapolis 500 are now complete. With four practices down, we can start to get a good look at which drivers are looking fast this May as well as which manufacturer has the upper edge around the 2.5 mile oval. Marco Andretti has been the most consistently fast driver of the week, finishing in the top five in speed in all four of the practice sessions so far. He is the only driver to do this and also holds the fastest lap recorded so far with a 227.053 mph lap in the third practice session. This lap speed is 0.7 mph faster than the second fastest driver so far, Scott Dixon. Andretti’s Honda was the first of what would become two Honda drivers at the top of different practice sessions: A Chevy-powered driver finished in the top spot in the first and second practice sessions, and a Honda-powered driver did the same in the third and fourth sessions. This led me to wonder which manufacturer has had the upper hand so far at Indy. For the purposes of this article, I chose to look at top to bottom speed for each manufacturer, meaning I included every driver’s top speed so long as they met the minimum 215 mph lap speed in the given practice session. I could have chosen to look at just the top five or ten drivers for each manufacturer, but in order to gain a holistic view of the field at this year’s 500, I looked at all 35 drivers who will attempt to qualify for the race. In order to see which manufacturer has the upper hand, I found the average top speed for all drivers in all four of the practice sessions so far, separated by manufacturer. Chevy had a total average top speed of 223.323 mph for the four practice sessions and Honda had a total average top speed of 222.775 mph. This is a close gap between the manufacturers, but our analysis isn’t done yet. 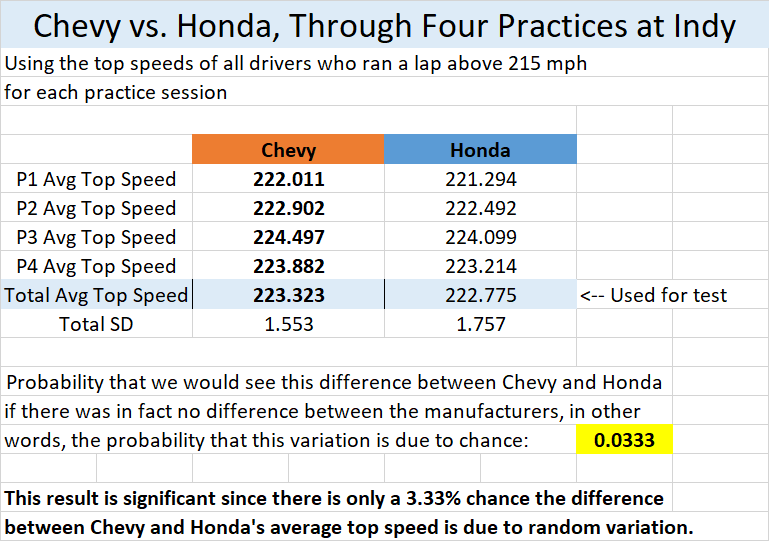 In order to test whether the gap between the manufacturers is significant, we can use what is called a Two-sample t-test to see what the probability is that the gap we see between Chevy and Honda is just due to random variation and chance. As we can see, there is just a 3.33% chance that we would see a gap at least that big between Chevy and Honda if the performance of the two manufacturers was actually equal. This means it’s very likely the gap between Chevy and Honda, taking into account all drivers, is real. Chevy has a slight advantage across the field through four practice sessions. More specifically, since the top speeds of sessions (which we used in our analysis) are almost always set using a tow (following another car in the draft), we can say that Chevy has an advantage when running in a pack over Honda. Friday’s practice at the speedway will be used to get teams ready for the qualifying sessions that are scheduled to take place this Saturday and Sunday. This will hopefully give us data on no-tow speeds in qualifying trim and give an idea of what we can expect for qualifying this weekend. For now we can comfortably say that Chevy has the speed over Honda when running with other cars, but that’s not to say that won’t change over the next week as teams perfect setups and get ready for the Indy 500.